An hourslong tri-county pursuit came to a bizarre end in Riverside County Monday after the driver traveled on the wrong side of the road and drove recklessly on freeways and streets before running from the Camry, with authorities chasing another sedan leaving the parking lot. The chase began in Orange County on the 91 Freeway when license plates on the 2002 black Toyota Camry came back as stolen, kicking off a pursuit that reached speeds from 85 to 100 mph. The chase continued on for hours, heading eastbound to Riverside and San Bernardino counties. 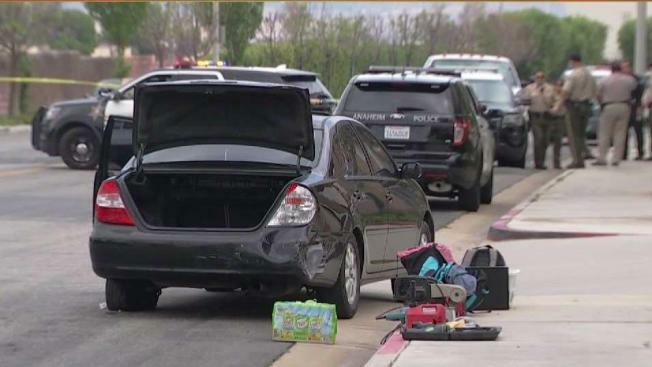 At one point, the driver threw objects from the window -- one of which hit a patrol SUV -- as the chase continued on the 10 Freeway in the Rancho Cucamonga area. From there, the hourslong chase continued east from Riverside County into San Bernardino County. The driver was on a street in Riverside when a trailing officer attempted back-to-back PIT maneuvers that failed to stop the Camry. Despite stopping at least twice on streets, the driver continued on. Two hours into the chase, the driver stopped and ran from the Camry. A woman riding in the passenger seat also ran. The driver ran into a building at 3463 Grapevine in the Riverside community of Glen Avon, but was taken into custody. He managed to change his blue shirt to a black one while inside the building but officers still got him. The woman then hopped into another black sedan that had a couple and a baby inside. The sedan had pulled away from the same parking lot, which started the second chase. The second black sedan was eventually stopped in the Colton area. The couple said they were just giving her a ride because she asked. A news photographer told her to give herself up and get out of the car, and she did. Police took her into custody. Police later confirmed the identity of the driver as Christian Beltran and the woman as Cecelia Martinez. Beltran was charged with felony evading, driving a stolen car and possession of stolen property. It wasn't clear if the family knew the pursuit driver or passenger.